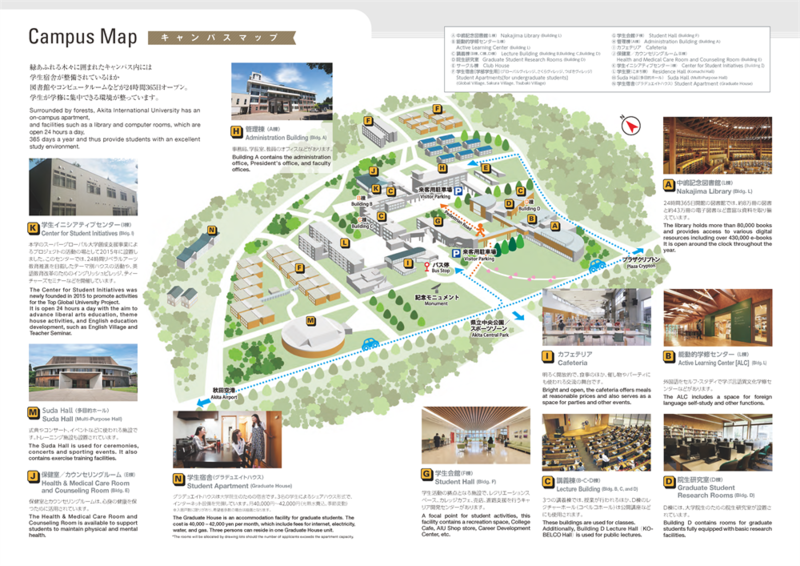 The campus is conveniently located 10 minutes by car from the Akita Airport. There are regular buses to the nearby AEON shopping center. Bus schedules and other access information are available on the access page. The AEON shopping center offers over 150 shops, including clothing stores, a pharmacy, a grocery store, on international foods import store, restaurants, cafés, a theater, bank, and many other facilities. It is generally open from 9:00am to 9:00pm (a grocery store in the mall opens from 7:00am to 10:00pm). A large public sports complex is just across the road from the campus. The sports facility includes an all-purpose gymnasium, tennis courts, athletic track field, cycling paths, archery fields, baseball diamonds, and weight training rooms. Personal use of these facilities requires a nominal fee, but AIU subsidizes use by university-sponsored clubs. The environment here allows students to focus on their studies. The library and computer room are open for student use 24 hours per day, and we have a dormitory and apartments on campus. Please click here for the access to the AIU campus.